“Don’t judge a book by its cover”, as the well-worn adage goes. 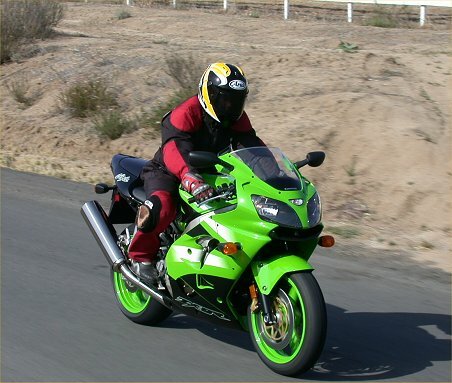 This is appropriately applied when considering the performance of the 2002 Kawasaki ZX-9R. 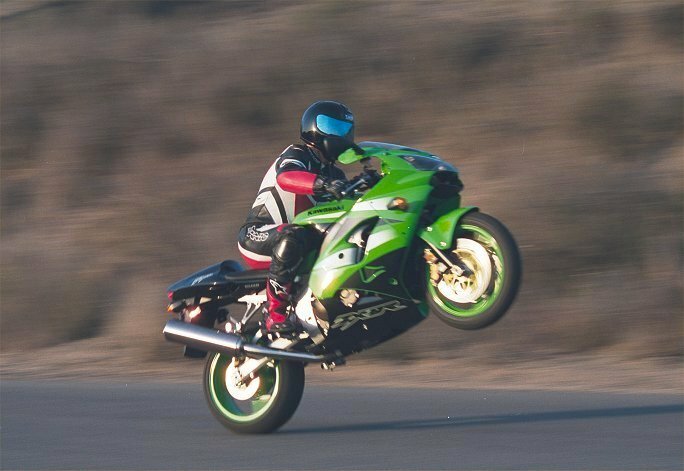 In recent years for the open class, Kawasaki’s contender had been relegated to the back of the pack, and then basically sent off to the sport-touring arena. What a difference a (model) year makes. Picking up the ’02 ZX-9R at Kawasaki’s HQ, I was greeted by the familiar racing green paint that has adorned all of K.H.I.’s race bikes here in America, and most of them abroad. There is another color that I was hoping to get – Candy Gold Spark, as it is called by Kawasaki, but it was not to be. That’s okay, Eric Bostrom’s bike is green . . .
A quick briefing from Kawasaki’s head of marketing, Mel Moore, about the new bike’s features was nevertheless thorough, with special attention focused on the front brakes and their new-found power. Larger in diameter, they now measure 320mm. Gone are last year’s six-piston Tokico calipers, with newly-designed, four-piston Nissin calipers in their place. With the four-piston calipers clamping on the rotors, lots of initial bite means quick response to lever input, which took a little adjusting to, and very linear power — more lever pressure resulted in more power in 1:1 proportion. Very controllable, very reassuring, and two fingers is all that would ever be required to get you hauled down from the heady speeds this bike is capable of. The front brake is so impressive, I had to see if Dirck felt the same way . . . and he did. The best front brake either of us has experienced on a stock motorcycle, but one that requires considerable respect from less experienced riders. Now that the considerable “whoa” has been talked about, how’s the “go” part? 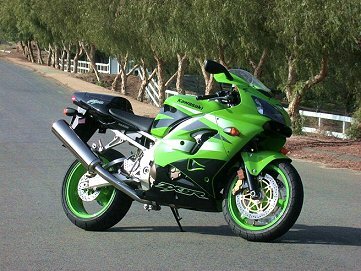 Kawasaki has always managed to squeeze eyebrow-raising power and speed from its 899cc engine. 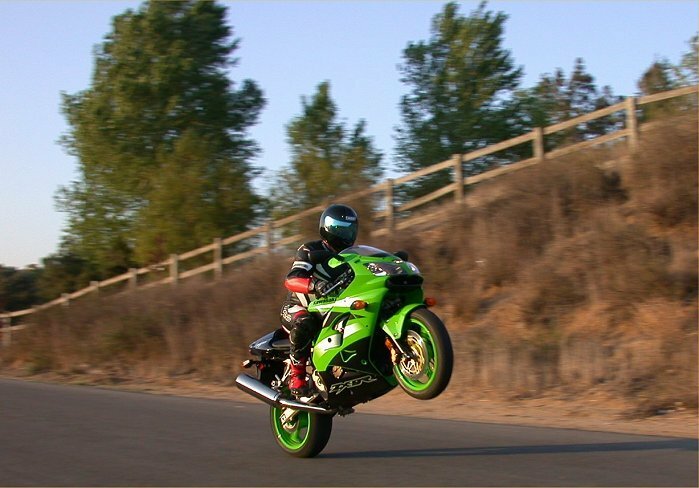 Top speeds of the ZX-9R throughout the years have either been class leading, or right in the thick of the group. An examination of the basic engine architecture reveals nothing out of the ordinary for the transverse four-cylinder engine with double overhead camshafts opening and closing four valves per cylinder, fed by a new set of 40mm Keihin CV carburetors this year. Kawasaki’s Throttle Responsive Ignition Control (K-TRIC) system has the optimum ignition timing for any throttle setting and helps get the most bang from the air/fuel mist for each power stroke. Compression continues to be highest in the open-class, at 12.2:1. This helps power production, no doubt, but also mandates the use of 90 octane or better fuel. Better performance in the lower region of the tachometer is also aided by adjustments to the crankshaft’s mass, adding 10% more mass to the crank webs, but reducing the flywheel’s diameter. More weight concentrated closer to the axis of the crankshaft reduces gyroscopic effect, helping the motor spin up quicker, without hurting drivability, and aiding handling. The ram-air system force feeds the carbs from the highest-pressure region of the bike, centered under the headlight, and produces a pleasing growl under large throttle openings. The spread of power is wide and the output considerable, with smoothness that makes this bike a good candidate for long distance duty. The exhaust system features a titanium muffler, unless you happen to live in California, where the muffler material is stainless steel and contains a catalytic converter (with no horsepower loss) to make sure the bike meets CARB standards. This muffler has also been repositioned for better (more aggressive) looks and increased ground clearance. Form and function go hand-in-hand in this instance. Also, a divider plate extended to just past the collector helps mid-range response. All that power is well and good, but can it be made to change direction without a bunch of drama? Yes, it can . . . probably better than you might think. The chassis and suspension have also been refined. Aside from the brakes, the chassis and suspension are the most noticeable functional improvements to the bike. The front forks contain springs that are on the soft side, but have adequate adjustability to accommodate a wide range of riding situations. Damping in rebound and compression mode is pretty well matched to the bike, with adjusters that actually have an effect on the ride quality. 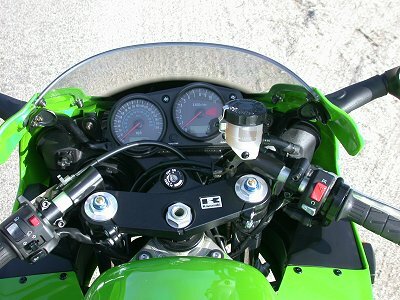 The 2002 ZX-9R features additional frame stiffening by Kawasaki, as well. A new front engine mount was added closer to the steering head to improve the engine’s function as a stressed frame member. All engine mounts are now rigid rather than rubber, for further stiffining (the silky smooth engine makes this possible). The stiffer chassis responds quicker, and more precisely, due to changes in the offset and pitch of the forks (less offset and more pitch). All somewhat subtle chassis changes, but very effective. In the rear, the swingarm has been strengthened by a reported 20%. Employing a hexagonal, rather than square cross-section, and adding a brace accomplished this. The linkage it attaches to has had leverage ratios adjusted to be more linear (read, compliant) as the rear suspension moves deep into its travel. Ride height adjustment is possible with a simple design that requires only a 22mm wrench and a stack of shims available from Kawasaki. The shock works really well, but needs tools to adjust the preload that either didn’t come with this test unit, or simply are not provided. This required the 70s era technique of preload adjustment – hammer and screwdriver on the threaded collars. It was fun to experiment with ride height adjustments at the roadside – 5 minutes was all that was required to make a change. All sport bikes should have the ability to be changed so easily and quickly. 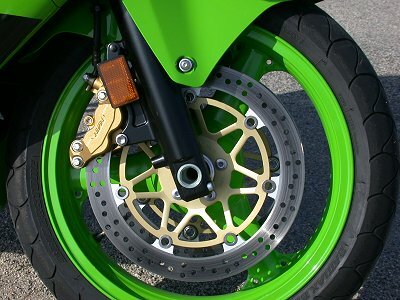 Ride height is an essential feature to proper suspension setup, allowing the rider to adjust ride height independent of spring preload, rather than using spring preload to adjust ride height, which often leaves the suspension too stiff to properly respond to the road’s bumps, or too soft, bottoming out at the sight of any road irregularities. Getting on the bike gives the impression of being on a larger bike, which, when compared to its classmates, it is. Instrumentation is analog, with digital displays for the odometer, dual trip meters, clock and temperature gauge. Turn the key and watch as the stepper motor cycles the instrument needles around the dials and back, open the fuel enrichening circuit (or choke, carbs, remember? ), hit the starter button and the motor jumps to about 3000 rpm. Adjust the choke lever to lower the idle to 2000 rpm and put on the helmet & gloves. By the time you finish doing this (on a 55 degree morning) the bike is ready to ride. Strong, useable power is available whenever the engine is running, and it delivers this power with minimal vibration, . . . only a very slight hum coming through the bars and pegs, just enough to let you know it’s running. Carburetion is on the lean side, making transitions from closed to open throttle a little sharp, requiring a disciplined throttle hand to keep things in check. Handling is very good. Fluid and predictable, with good feedback from the revised, stiffer chassis (particularly, after appropriate ride height and suspension adjustments — see below). The bike’s weight and, to a lesser extent, its bulk, requires a little more effort than some of the lighter sportbikes to get to your desired lean angle, either from vertical or in “S” transitions. Ground clearance is very good, as I only touched the footpegs occasionally, using the Bridgestone Battalax 012s right to their edges. I couldn’t help thinking that replacing the 190 section rear tire with a 180 section would help speed the steering without adversely affecting stability, because it helped my personal bike in a very positive way. Time and resources did not allow for this experiment, however. While riding the local twisties, I progressively adjusted suspension and rear ride height, because the settings that came on the bike left me with too little road feel. More ride height in the rear, with less preload and damping on the shock and more preload and damping up front produced a very balanced motorcycle. Turn in for a corner was both lighter, quicker, and more precise without being twitchy under hard throttle on the way out. Gotta love that ride height adjustment! The awesome brakes worked very well, and never hinted at getting tired, or required more than two fingers-worth of pressure. Trail braking into a corner, or braking upon discovering a closing radius corner, produced only a mild tendency to stand the bike up. During the ride home on the freeways of SoCal, the larger size and weight of the bike is welcome. 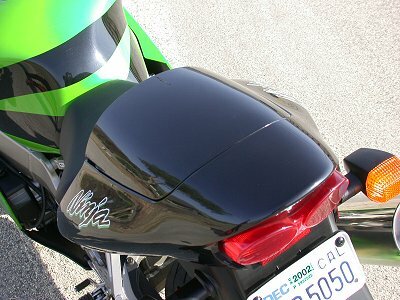 Fairing protection is quite good; I’d only want to add a double bubble windscreen. The weight actually aids in smoothing the bumps, and makes proper suspension adjustment in this mode less important. Ergonomics don’t fold you up like a jackknife, and allow for movement on the seat, which does not torture you like some others do. Rider weight feels nicely distributed between all contact points, at the handlebars, seat and pegs. Vibration does not affect comfort, because so little of it is present. Gas mileage is also quite good, averaging in the low 40s, but you’ll need to keep track of the fuel tank’s petcock position. There is no low fuel warning light, only the trip odometer (if you reset it at fill up), and the “on” and “reserve” positions on the petcock. Passengers will be adequately accommodated for shorter rides, but the passenger grab rails should have been retained (the front brakes will certainly have the passenger up against the rider). The passenger sits above a small storage area that can hold a pair of gloves and a map, or a VHS tape. I really enjoyed this motorcycle. I especially enjoyed the transformation it made when I adjusted the suspension settings and chassis attitude (take a look at our recommendations below). Its speed and composure in the corners will surprise some riders of the newer, fuel injected, flyweight superbikes. When combined with this bike’s ability to adapt to many duties – commuting, sport touring, sport riding, track days, or going to the video store to rent a movie — you have an attractive package, indeed. It can be many things to many people. The cover of this book from Kawasaki is familiar, but the story has some new twists and a surprise ending . . . 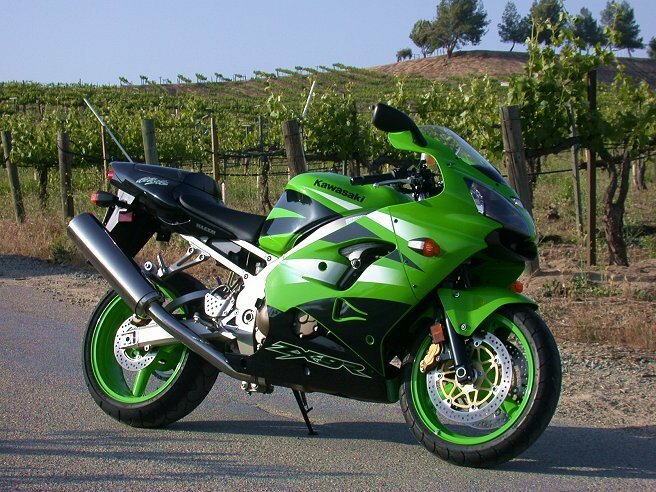 The U.S. MSRP of the 2002 ZX-9R is $9,499. 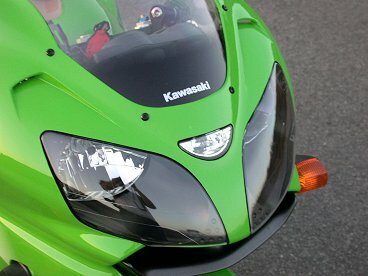 Take a look at Kawasaki’s web site for specifications.